Welcome to our Ultimate Guide to Cloth Training Pants! 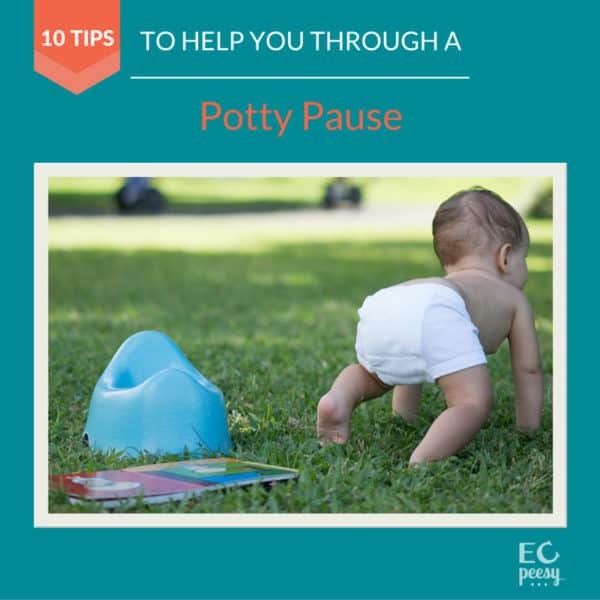 If you are looking for the best cloth potty training pants, you are in the right place! This comparison review includes cotton training pants and also waterproof cloth training pants. These are all washable reusable training pants. We've included both toddler training underwear and training pants for babies. 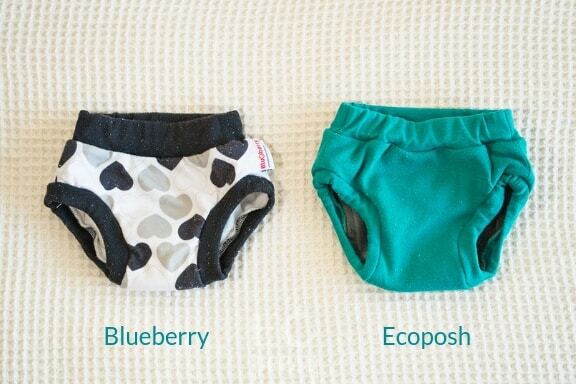 For each style of potty training pants we will cover: how they fit; how well they contain pee; ease of washing and drying; ease of pulling up and pushing down; types of fabric; and cuteness! I will also provide on-the-body photos of the training underwear on my daughter. 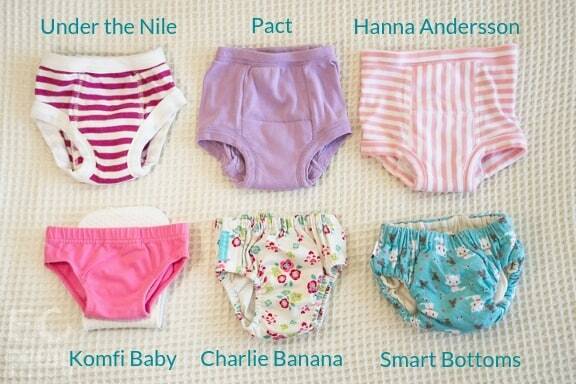 I've been testing these potty training underwear for the past four months in order to share my top picks! Find out which cloth training pants are the best match for your potty training toddler or baby practicing elimination communication. If you're not sure whether it's the right time for your child to switch to cloth training pants, please start by watching my introduction to Cloth Training Pants 101. I will explain what cloth training pants are, when to use them, and the benefits of choosing cloth training underwear. Before reviewing specific brands of cloth training pants, I'd like to share some photos showing the range of styles and sizes. Disclosure: Some of these training pants were gifted to me by the brands, in order to facilitate this review. All opinions are my own. This post contains affiliate links. 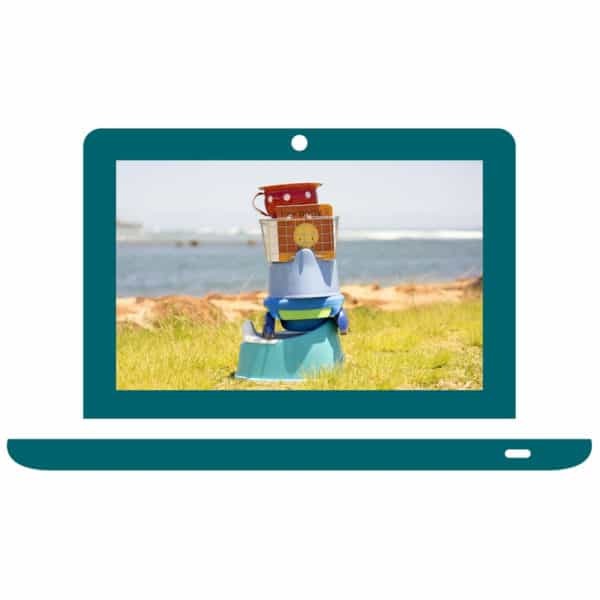 If you click on an affiliate link and make a purchase, I will earn a small commission, at no extra cost to you. Thanks for your support! The organic cotton training pants shown above are Under the Nile size 12-24M; Pact size 2T/3T, Hanna Andersson size XS, Komfi Baby size 12M, Charlie Banana size M, and Smart Bottoms size 2T. 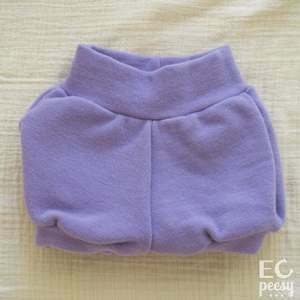 The training pants shown above start from small sizes, so they can be worn by babies practicing elimination communication. The EC training pants pictured are Komfi Baby size 12M, Tiny Trainers size 12M, TinyUps size M, Charlie Banana size M, Nicki's Diapers size S, Smart Bottoms size 2T, Super Undies size S, and Kanga Care Lil' Learnerz size S (also available in XS). You can either read the entire review or skip ahead to one of these brands of training pants. Be sure to check our Coupons Page for discounts on some of these training pants. Tiny Trainers - Top Pick: Best non-waterproof cotton training pants for babies practicing elimination communication. Under the Nile - Top Pick: Best non-waterproof cotton training pants for toddlers. City Threads - Top Pick: Waterproof training pants that look the most like regular underwear. 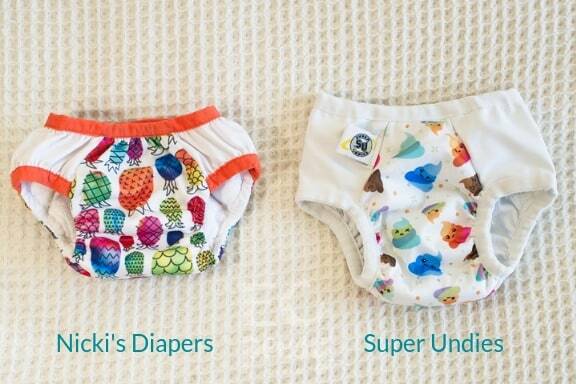 Nicki's Diapers Trainers - Top Pick: Best waterproof training pants for babies practicing EC. Super Undies - Top Pick: Best pull-on waterproof training pants. Charlie Banana - Top Pick: Best waterproof training pants with an organic cotton lining. Kanga Care Lil Learnerz - Top Pick: Best side-snapping cloth training pants. Blueberry - Top Pick: Runner-up for most comfortable. Ecoposh by Kanga Care - Top Pick: Most comfortable waterproof training pants. GroVia - Top Pick: Best option to use as a pull-on style diaper. Non-waterproof cotton training pants are basically underwear with extra padding in the wet zone. They are intended to absorb one pee and should be changed right away when wet. Cotton training pants will not stop clothes from getting wet, but they should prevent puddles on the floor. Let's start with two brands that offer small training pants for babies who use the potty (starting from size 6 months) and then we will cover toddler training pants (starting from size 12 months). The main difference between training pants designed for babies and those intended for toddlers is that baby training underwear have a much lower rise, so the waistband sits below the baby's belly. 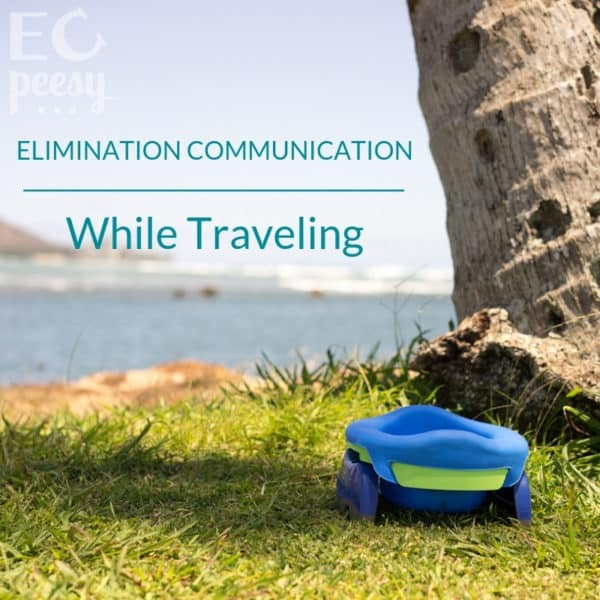 Top pick: Best non-waterproof cotton training pants for babies practicing elimination communication. The leg holes run small and don't stretch very much. These are very low rise, so they don't cover my baby's bottom all the way in the back. Thick padding without being too bulky. These have the most absorbency compared to other cotton training pants. Without a cover over the trainers I could feel my baby peeing and have enough time to move her away from me before the pee seeped through and got my clothes wet. Contain misses well since the leg holes are tight. Easy to wash and dry since they are 100% cotton. Instructions say to wash on cold, but I wash on hot or warm, expecting them to shrink. Pretty easy to pull up and push down as long as the leg holes are not too tight. I wish there was an organic cotton option. Very cute on my baby! My daughter started wearing size 12M Tiny Trainers when she outgrew her newborn cloth diapers at 3-months-old. 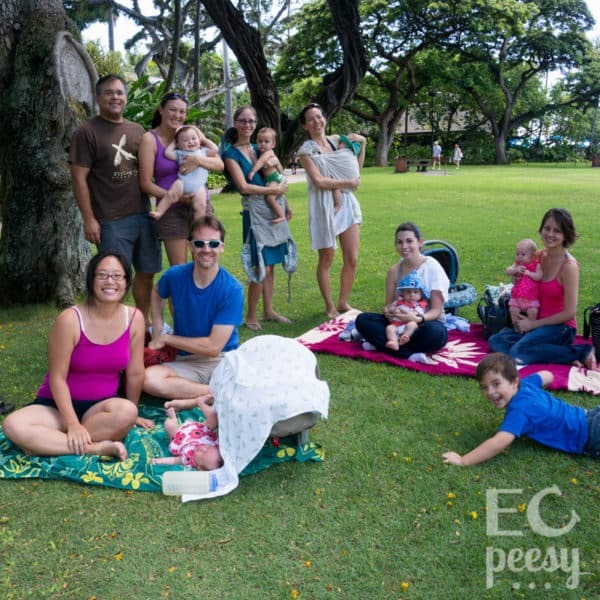 Tiny Trainers are the best option for small babies doing EC. I just wish the leg holes and waistband stretched more. Please add leg elastic to make the leg openings more stretchy! My daughter outgrew these very quickly because the leg holes were too tight. Stretchy leg holes would allow them to be worn for longer. These underwear are perfect for babies doing elimination communication. They also go up to size 2T/3T. These are nice for babies with chubby thighs since the leg holes are stretchy. Very trim, even with the soaker pad inside. These are a two part system: regular underwear and additional soaker pads that can be worn inside the underwear. They don't absorb a whole lot, so wetness still soaks through. Super easy to wash and dry since they are thin underwear and separate soaker pads. Easy to pull up and push down since both the waistband and leg holes are stretchy. A toddler would have difficulty using these independently, since the soaker pad would fall out. 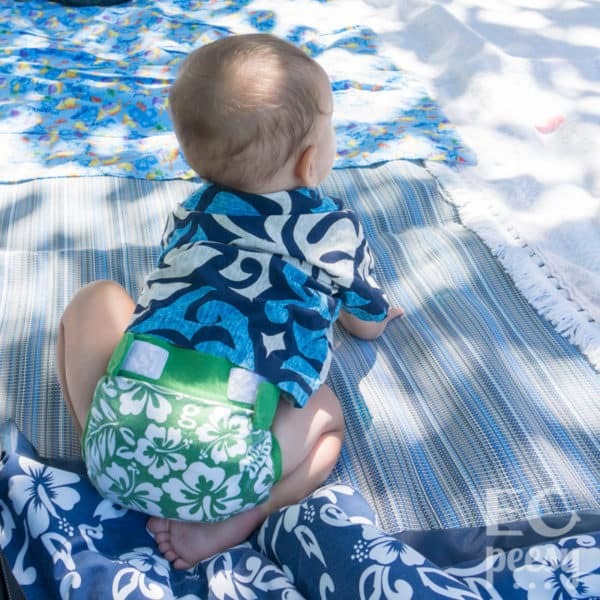 Komfi Baby underwear are super cute on my baby and I really like the organic cotton fabric. 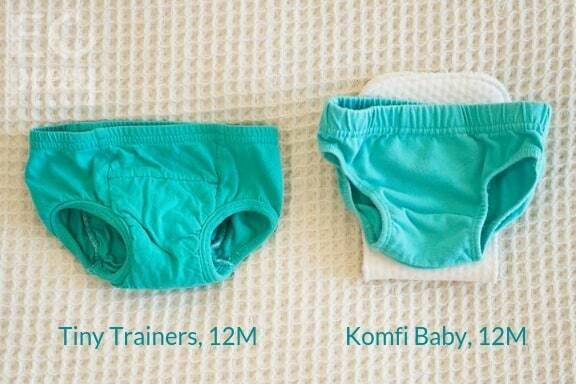 Komfi Baby is my favorite source for organic cotton baby underwear. I hope at some point they offer cloth training pants with the absorbency built-in instead of separate soaker pads. I like the wide elastic in the covered waistband and the stretchy waistband. It would be great if the soaker pads could either attach to the underwear or if they were sewn in. I prefer the convenience of training pants that are only one piece, so they are easier to put on and take off. Now we will look at cotton toilet training pants for toddlers. These styles start from bigger sizes and have a higher rise. Top Pick: Best non-waterproof cotton toddler training pants. Awesome for young toddlers and perfect for Montessori toilet learning. I wish they made one size smaller for babies doing EC. They leg holes were still too big on my daughter at 7-months-old. These have a relatively small waistband and big leg holes. The waistband is nice and stretchy, though, so it doesn't fit too tightly. Thick layer of absorbent padding, but overall they are still trim. These have more padding than most cotton trainers but not as much as Tiny Trainers. These hold up really well being washed and dried repeatedly. They can be hand washed in the sink but might take a while to dry if hanging to dry. Easy to pull up and push down. I wish they would release some solid colors or new prints. These are my favorite cotton training pants for toddlers. If they came in a smaller size they would also be awesome for babies. Please add a smaller size! I would love to see Under the Nile training pants in size 6-12M. These have a high rise, so they work best on toddlers. They have small leg openings compared to other brands so they would be good for toddlers with thin legs. They do a good job of absorbing a pee. We had a set of these for our son and they did not hold up as well to repeat washings as Under the Nile training pants. They have a wider waist opening than other brands of cotton training pants. I like the conservative cut of Hanna Andersson trainers. We will be able to get more use out of these once my daughter is a toddler. Right now they sag too much on her. I wish that the absorbent interlining was also organic cotton. The high rise on these is intended for toddlers. The leg holes are a good size. The elastic in the waistband is way too tight. After washing, the waistband stretches from about 14-16". There is a good amount of absorbency while still being trim. Would contain a pee well if they fit correctly. The rise is still too tall on my daughter so they sag on her. I like the simple solid colors. These have a very similar cut to Gerber training pants. I had high hopes for Pact training pants, since I love the Pact organic cotton wrap dresses that I wear. I hope that Pact fixes the design flaw on these by making the waistband stretchier or sized to fit a larger waist. 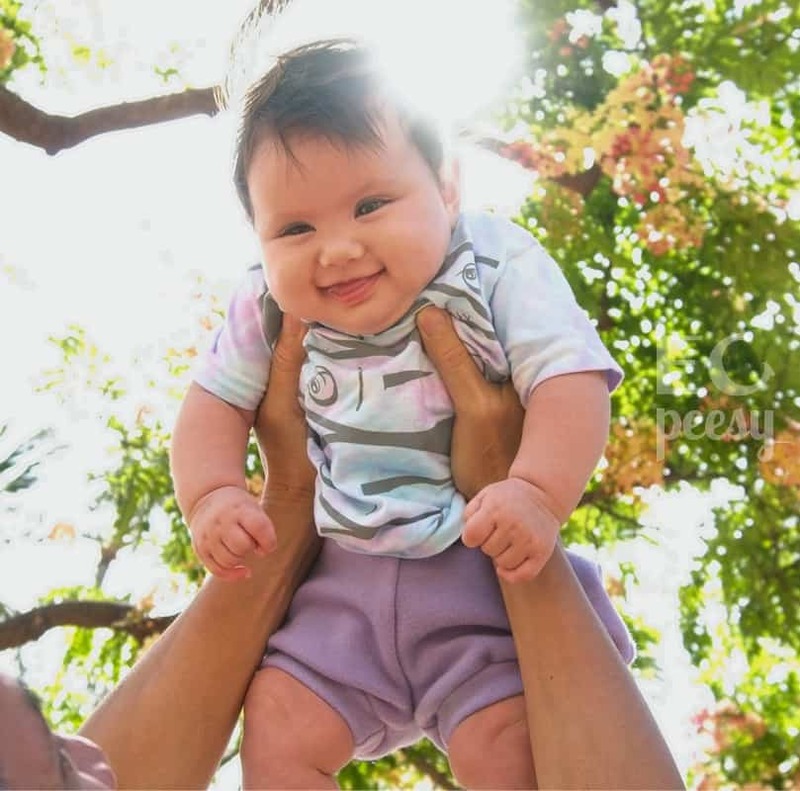 Update 4/14/2019: Pact Apparel is no longer offering cloth training pants, but they do offer organic cotton tee shirts for babies and toddlers starting from size 6-9M. These are a bit bigger than Tiny Trainers or Komfi Baby underwear, but they could work for bigger babies practicing EC. Gerber training pants do not contain a miss well. I'm pretty sure that when my daughter peed in these the other day the pee went straight through them and to the floor. These white ones are super simple, but they also come in colorful prints. The only time I like to use Gerber training pants is when my daughter is joining us at the table for a meal. I know they will get food on them and need to be changed right after the meal. It would be better if the absorbent layer was cotton and more absorbent. Tiny Trainers probably absorb 3-4 times as much as Gerber trainers. At home I like my daughter to wear cotton training pants with nothing over them so I can see right away when they are wet. That way we can change them right away. For leaving the house we add wool shorts over the training pants, to provide a semi-waterproof layer. The wool shorts act both as a cover to contain wetness and as clothing. Other great options are wool soakers, skirties or longies. Wool is not 100% waterproof but as long as the training pants are changed frequently the wool should be able to trap the wetness inside. If your child holds their pee for a really long time and then lets it all out at once, woolies with only trainers underneath may not be enough to contain the pee. I like to hand wash interlock wool shorts, but often interlock wool can be machine washed on a gentle cycle. It's important not to shock the wool fibers with too hot or too cold of water. I usually let a pair of wool shorts hang on a drying rack over night to dry. Woolies only need to be washed and lanolized about every two weeks. I prefer woolies that are a bit loose on the waistband, so they are easier to pull up and push down. I love that wool is a natural fiber. Wool bubble shorts, shorties, skirties, capris, and longies can be so cute! Woolies are awesome for elimination communication or potty training! The lanolin in wool neutralizes urine, so even if the wool cover is peed in it can be reused over and over again! I love that wool shorts serve as both a waterproof cover and clothing at the same time. Wool is also very breathable so it doesn't trap sweat. I love purchasing woolies from Truly Charis since they are a family business. Next time I order Truly Charis woolies for my daughter I will request +1" on the waistband so that it is not as tight on her waist. I like them to be easy to take off and put back on. Waist 16", thighs 8", hips 19.5"
These XS bubble shorts were already too small when we received them. She started wearing a size medium soaker at 7-months-old. 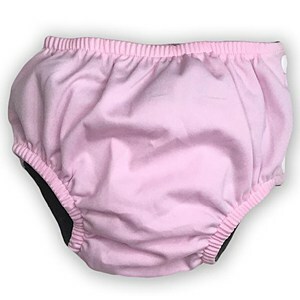 Waterproof cloth training pants can be similar to a pull-on style diaper or more like padded underwear with a waterproof layer in the wet zone. Most training pants are only semi-waterproof, so wetness will seep through if they are not changed right away. 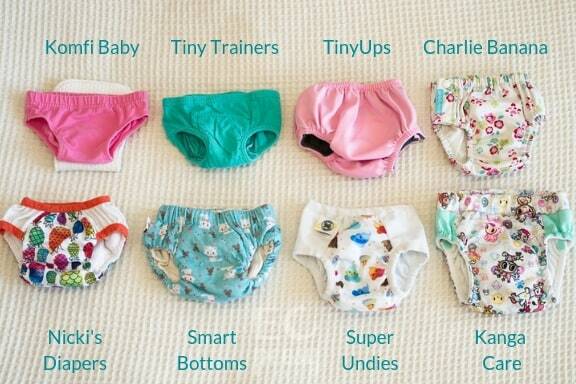 I tested these waterproof potty training pants on my daughter and organized them by similar styles. Top pick: Waterproof training pants that look like regular underwear. At 7-months-old, size 12-18M fit the best on my daughter. The smallest size is good for babies practicing EC. City Threads training pants are also a great option for potty training toddlers, since they closely resemble underwear. The padding section that runs through the middle is a bit thick, but overall these are one of the least bulky options for waterproof training pants. The side panels are just one layer of cotton. These don't have much elastic around the leg holes, so they need to fit snugly to contain pee. They take a while to dry due to the thick padding. I like the cotton body on these. There are lots of bright solid colors. This is another high-quality product from City Threads. I already love their toddler underwear. I wish these didn't have the waterproof PUL layer and were just breathable cotton trainers. With the waterproof layer I can't tell right away when my daughter pees. 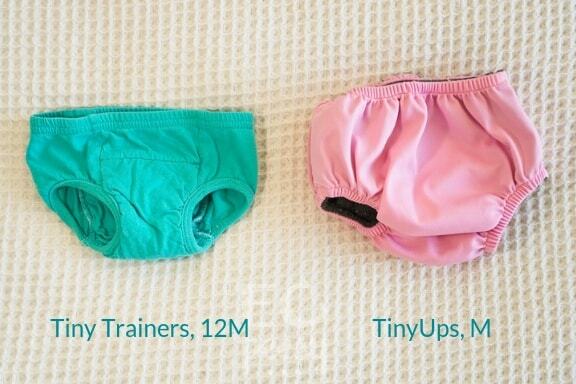 Here is a comparison photo of Nicki's Diapers trainers and Super Undies, which are both pull-on training pants with stretchy sides. 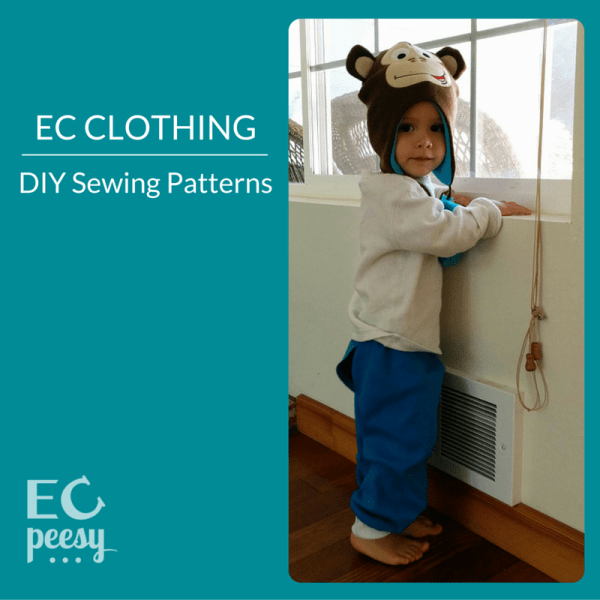 Top pick: Best waterproof training pants for babies practicing elimination communication. These are an excellent choice for babies practicing EC, since they are so small. They are good for babies with thin legs because of the elastic around the leg holes. They would also be good for young toddlers who are learning to self-dress. The cotton layer gets a little rough after multiple washings. I like that there is a cotton layer touching the skin. Economical choice for waterproof training pants. I wish I had known about these with my first baby. He was slender and I kept waiting for him to grow into training pants. The outer Polyester fabric is rough. It would be nice if it was a softer material. Top Pick: Best pull-on waterproof training pants. Bigger than Nicki's Diapers trainers, but they still work for babies doing EC or small toddlers. Higher rise than some of the others, which is good for my daughter since they cover her bottom all the way. This is the pull-on version. Super Undies also offers side snapping and bed wetting versions. 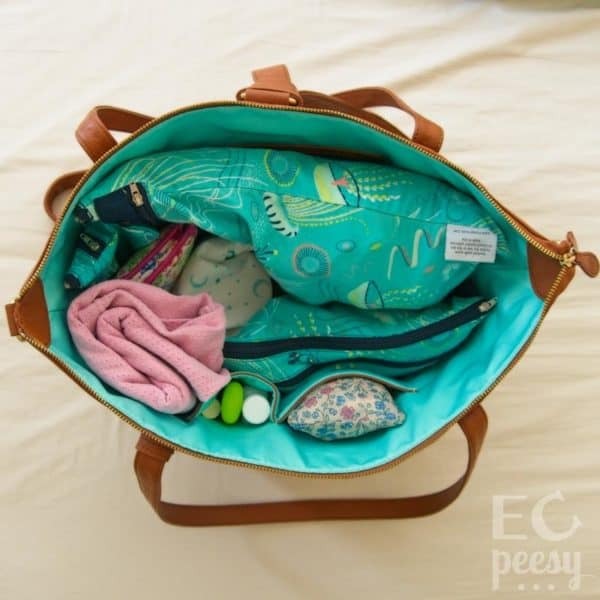 There is a pocket where you can add extra absorbency. They absorb pee well, but they did leak out the side once when my baby was lying on her side. These are so good at absorbing that it can be hard to tell if my baby peed. The leg and waistbands look a bit worn after multiple washings. These are the best waterproof option as far as pulling up and pushing down. There are some really cute prints. I love these Unicorn Drops! Overall I really love these trainers. They just wouldn't be good when you are trying to wrap up the potty learning process, since your child may not feel wet when peeing in them. Outer Polyester fabric is loud and rough. It would be nice if it was a softer fabric. Here is a comparison photo of three brands of side snapping training pants. TinyUps are waterproof covers that can be worn over Tiny Trainers. These are intended for babies doing elimination communication. Serve as a waterproof layer over Tiny Trainers. Rise is too low to cover my baby's bottom completely. My baby quickly outgrew them. Row of snaps only on one side. I wish the snaps were on both sides. They do contain pee well when worn over Tiny Trainers. They could also provide a little bit of absorption on their own. We didn't try them separately. The dark lining collects pieces of lighter color lint in the washing machine. The lining material had a strong chemical smell when they arrived. I had to wash them a couple times to get rid of the smell before using them. There are some bright colors and a few prints, but the prints aren't my favorite. These are a similar cute shape to Smart Bottoms. I prefer using wool shorts over Tiny Trainers instead of these TinyUps. It would be better if there were snaps on both sides. I don't care for the inside lining material. I wish the leg holes were bigger for babies with chubby thighs. Top Pick: Best waterproof training pants with an organic cotton lining. Great for babies doing EC, since they come in such small sizes. Good for thin toddlers since there is elastic on both the waist and legs. Very trim for waterproof trainers. Either pull-on or side snapping versions. I prefer the side snapping (two snaps on either side). I like to unsnap them to hang them to finish drying. Contain pee better than I expected for how thin they are. Dry faster than some of the other waterproof trainers. I like the smooth organic cotton lining. There are some cute prints. I wasn't expecting too much from Charlie Banana Extraordinary Training Pants but they ended up being one of my favorites. Too bad my daughter outgrew size M so quickly. We might have been better off with size L.
We used these while traveling for a few weeks. It would be helpful if they provided photos of babies and toddlers wearing each size, so you could get an idea of how small they run. The leg holes were getting tight at this point. Top Pick: Best side-snapping cloth training pants. I thought about trying the smallest size to give you a better visual comparison of the different brands, but I was tired of my daughter outgrowing trainers so fast, so I opted for the size that would continue to fit her for a while. These are good for both babies practicing EC and toddlers. Sizes XS and S have side snaps. The larger sizes are pull-on. The three snaps are nicely situated on the back. These do the best job of containing pee and poop. Since they are polyester it's a bit more difficult to wash the smells out of them. I like to unsnap them for washing and drying. Super soft fluffy Polyester inside. I normally don't like Polyester but this fabric does feel nice. Super cute! Especially if you like Tokidoki. Before I tried these, I thought people only liked them because of the Tokidoki prints. It turns out they are actually really well designed training pants! The style is awesome the way it is. It might be nice to have a version with cotton as the lining that touches the skin. Size small fit my daughter really well at 6-7 months old when her thighs were 11". 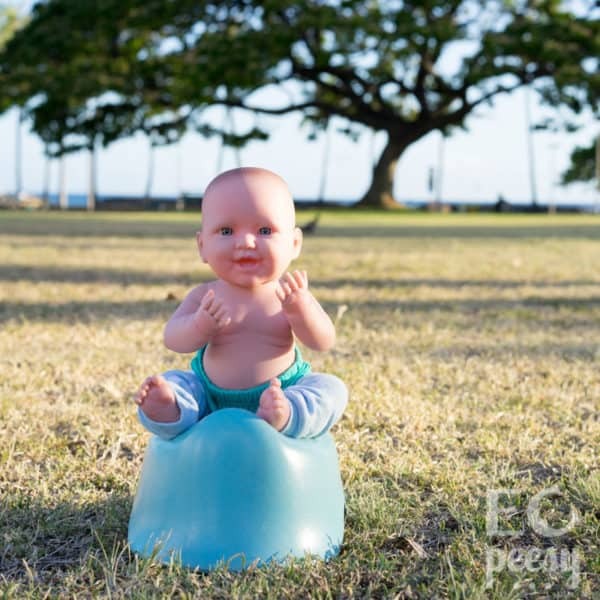 The small size and low rise makes these great for babies practicing EC. I should have purchased 3T instead, as my baby quickly outgrew 2T. Bulky, especially with the snap-in soaker. These did not do a good job at containing pee. The way they are designed, there is no barrier to prevent pee from wicking out through the leg holes. I really wanted to love these, but they just weren't functional. I like that the soaker can be removed for washing and drying. The outer fabric tends to pile. I love the organic cotton on the inside. One of the cutest options! I thought these were going to be my favorite waterproof training pants for EC'd babies. They are cute, small, made in the USA, and contain organic cotton. But they just didn't do their job of holding in pee. Please add additional stitching or a band around the leg holes to prevent liquid from wicking out. Top Pick: Runner-up for most comfortable. These are sized more for toddlers but may fit some chubby babies. Pull on style that almost looks like underwear. Contains pee well, but it will wick out if you don't change them right away. The outer fabric piles when washed. Similar to Smart Bottoms. Easy to pull up and push down, but sometimes the waist band elastic gets twisted in it's casing. One of the cutest options. There are some adorable prints! If I had chosen these myself I would have chosen a pretty blue, purple, or pink print. Since these were a bit big when we first got them we used them as a waterproof cover over Tiny Trainers. We normally use non-waterproof cotton training pants, but I'm temped to buy more of these in the next size for times when we want a waterproof option. They are so cute! I wish the cotton velour interlining was organic. There were a couple prints with organic cotton velour interlining but I couldn't find them anymore when I was looking for them. Size small fit perfectly once she was 6-months-old, 16 pounds, 16" waist, 11" thighs. Top Pick: Most comfortable waterproof training pants. These are sized for toddlers but may fit some chubby babies. The cut is similar to Blueberry training pants. These are a bit bulky and quite heavy. They absorb well, but moisture will start to wick out around the leg holes if they are not changed right after a pee. Poop washes off of these easily if they are rinsed right away. They take a while to dry since they absorb so much liquid. PET is Polyester made from recycled water bottles. The plush bamboo velour makes these luxurious training pants. These are made by the Kanga Care brand. When all the laundry has been washed I reach for Ecoposh and Blueberry trainers first, followed by Kanga Care Lil Learnerz. The design is great the way it is, I would just like to see them in more colors. These fit really well when my daughter was 6-7 months old. 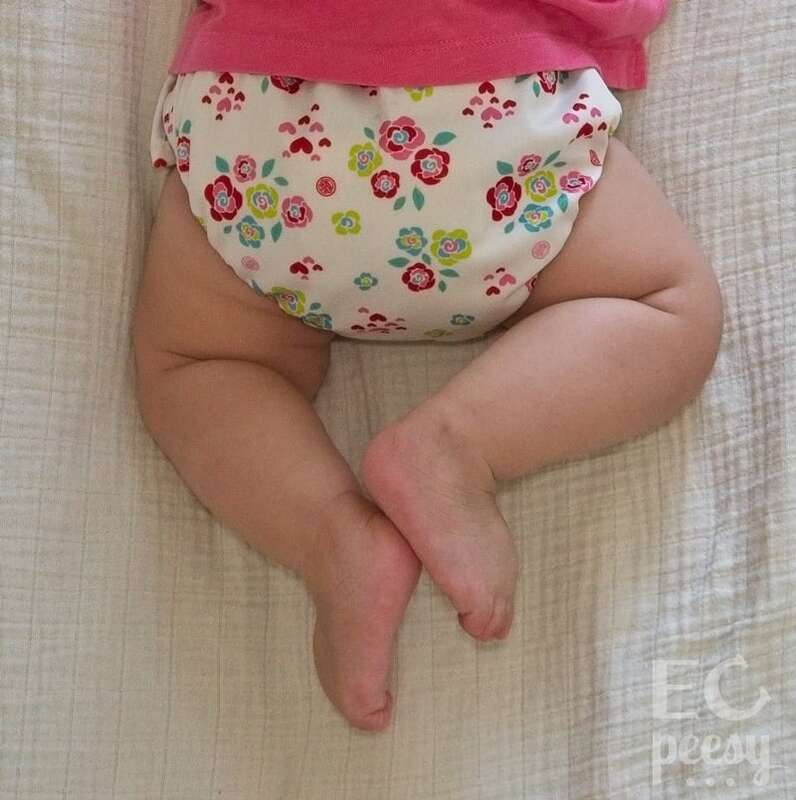 Top Pick: Best option to use as a pull-on style diaper. These are pretty tight around the waist. Even at 5-months-old they fit my daughter better with the Side Flex Panels Plus (3T-5T). These have some pretty heavy absorbency, but sometimes the pee still wicked out. 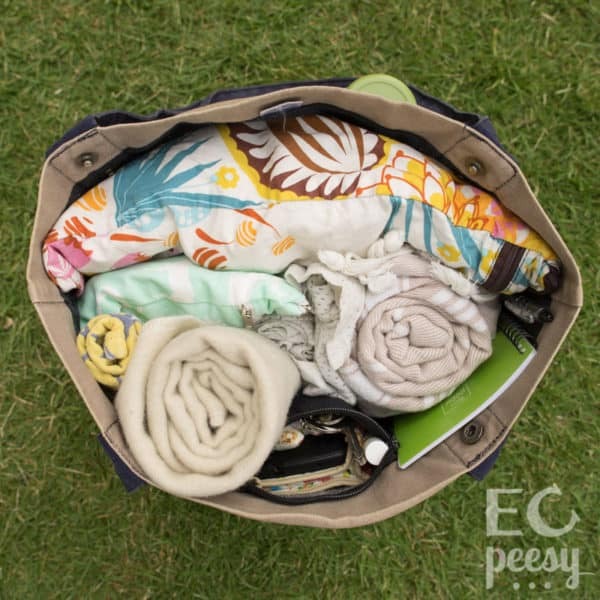 There is a pocket where you can add a booster for extra absorbency, but we didn't try them that way. The absorbent core takes a while to dry since it is a dense cotton/hemp terry. These were the most difficult to pull up and push down since they were tight around the waist. Along with the training pants, GroVia sent me a Hybrid diaper shell which you can see in my video Easy Cloth Diapers for EC. They also sent a set of super cute little 2T boxer style underwear and tank tops. The underwear are a great option if you are looking for small toddler underwear. I wish I had found the GroVia tank tops sooner, since the white tank tops in these photos were way too big on my daughter. I personally prefer cotton training pants that are more like underwear, but if you are looking for trainers to use as a pull-on style diaper then these would be a great choice. We started using the Side-Flex Panels Plus (3T-5T) right away. These consist of a waterproof outer portion and snap-in soakers. The leg holes are huge and there is no elastic in them. Since there is no elastic in the leg bands these tend to gape and allow pee to leak right out. I like that the waterproof outer and absorbent soakers can be washed separately. I like that the outside looks like underwear, especially for potty training toddlers. There are some cute prints and they match with Planet Wise wet bags. I thought I would give these a second try, since my daughter has much chubbier thighs than my son did, but they still don't fit her either. Please add elastic to the leg bands so these can function properly! My son used these as a toddler, but the pee would go straight to the floor since the leg bangs were not tight enough. That wraps up our Ultimate Guide to Cloth Training Pants. 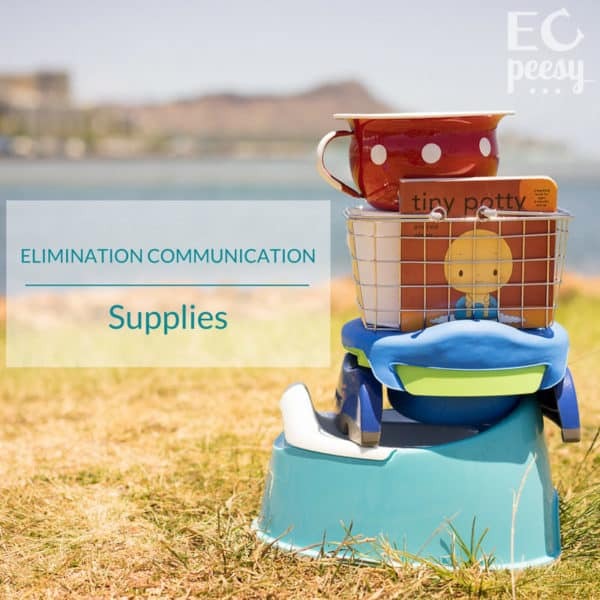 You may also be interested in reading our lists of Early Potty Training Supplies and Elimination Communication Supplies. 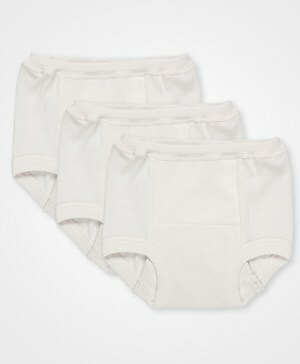 How will cloth training pants be a useful tool during your child's elimination communication or potty training journey? Which brands of cloth training pants are you planning to try? Wow that is so complete. Thanks for all the comparison pictures and the ones on your little girl help a lot too! Thanks for commenting. I’m glad you like the photos!